Continuing the theme for International Women’s Day, I would just like to share this trailer for the documentary Honor Diaries, which highlights the plight of women who are subject to the practice of ‘honor killing’ in Islam. These courageous Islamic women from around the world have joined together to share this. They are risking their lives to educate the world. Over the years I have read many women’s stories of injustices in the name of religion. Most recently I am reading ‘Now they call me Infidel’ by Nonie Darwish, the story of the daughter of a martyr for jihad, who questioned Islam from an early age and ultimately became an American, Christian, conservative Republican and an advocate for Israel! I would like to clarify that I am not singling out or against any religion and I am always open to listening to all opinions and values. I like to be educated and objective and present every angle so we can all learn about each other and learn to respect that there are different ways to look at things. Education and tolerance are the keys to moving forward and I remain committed to both. This entry was posted in Lifestyle Design on March 14, 2015 by lynne. Today we celebrate women all around the world on International Women’s Day 2015. Whilst we have come a long way, there is still a huge group of women whose needs are not being met and who are living well below the poverty line…. In their groundbreaking bestseller, ‘Half the Sky: How to Change the World’, Nicholas D. Kristoff & Sheryl Wudunn introduce us to a selection of extraordinary women, who are making a difference. Investment in education for girls and empowerment for women could well be the solution for tackling poverty, disease and conflict. Check out the Half the Sky movement on You Tube. I worked as a teacher in both the first world and in developing countries and I have been in business in Africa. One the fastest and most effective ways to create rapid change in developing countries (and the world at large) is through the financial empowerment of women. For only $50, you can sponsor a woman to take part in the Women Empowered program, and provide her with the training and support to create a business of her own. Are you ready to make a difference on this International Women’s Day? This entry was posted in Lifestyle Design and tagged collaboration, empowerment, Half The Sky, International Women's Day 2015, micro finance loans, micro saving skills, negotiation skills, Nicholas D. Kristoff, Project Concern International, Sheryl Wudunn, skills training, Women United for Change on March 8, 2015 by lynne. As International Women’s Day is coming up this weekend, I decided it was time to get back to this blog and share some of the initiatives for CHANGE that are empowering women around the world. Having lived, worked and travelled in many countries throughout the world, I accept and appreciate that there are huge differences in values and opinions on every subject. Whilst we will never all agree on any particular topic, we can raise our awareness by stepping into another person’s shoes, just for a brief moment in time, in an attempt to put aside our own personal values and ideas and accept that everyone, not only has a story, but has a right to tell it and express their opinions and be respected, not judged, beaten nor demonized for doing so. Allow me to start by sharing this TED talk by Jessica Jackely, the founder of Kiva, an organization that has facilitated more than 150 MILLION dollars in micro loans globally. She builds a powerful case for why helping women to start their own businesses is a major key to ending poverty in developing nations. I, personally, agree that entrepreneurship empowers and respects women in a far more effective way than donations and I fully support CHANGE in this direction. I have been following KIVA for some time now and Jessica’s TED talk and her story, particularly her vulnerability towards the end of the talk have increased my respect for her tenfold. Jessica’s talk appears along with other powerful videos on the Women United for Change website. Women United for Change is a movement led by women from across the network marketing / direct sales profession, strong believers in the power of entrepreneurship and in helping others transform their lives. By building their own businesses, these women have become empowered (personally, professionally, spiritually and financially) and want to help other women experience the amazing transformation that comes about by having a business (particularly those in the poorest countries in the world). By investing a small portion of the profits from their businesses into the Women Empowered program, they are making a big difference in the lives of other women (and consequently, for the world at large). Let me just add that, unfortunately, the organization that Jessica mentions towards the end of her video was shut down, for (in my humble opinion) totally inappropriate reasons…. but that’s another story for another day….. This entry was posted in Lifestyle Design and tagged abundance, Brene Brown, Direct Sales, Half The Sky, International Women's Day 2015, Jessica Jackley, KIVA, Loans that Change Lives, love, Network Marketing, Poverty, Poverty money & Love, TED talks, Vulnerability, Women United for Change, Women's Empowerment on March 6, 2015 by lynne. My goodness, it has been months since I posted on this blog! All my good intentions to do more blogging this year….. oh dear, can I make the excuse that I am only human? I got very busy with my new business and the blogging went by the wayside….. Sorry! Well, I began this year’s blog by talking about Making the Commitment and all the 30 Day Challenges I had completed in 2013. So I made a decision just the other day that October was to be my ‘Restart my blog’ month! If not actually posting daily, making the commitment to work for at least 1 hour a day on my blog/s. I also began the year with a sober month, one of the reasons being that it was in January 2004 that my dear Dad passed away just after his 70th birthday, a very sober time for our family in many ways. This January would have been his 80th birthday and it was also 10 years since we lost him. Then, to my surprise, a friend who had actually been a very close support to me during the months before and after my father passed away, just happened to have posted about this challenge for October! I had already decided it was probably about time for another month without the booze, but what better reason to quit than to actually help a cause that is close to my heart. As I said, my Dad passed away 10 years ago from angiosarcoma of the liver, a particularly aggressive form of cancer, which in his case, was caused by Thorotrast, which was administered to him back in the 1950’s. Is it worth going sober for October in support of Macmillan Cancer Research UK? This entry was posted in Lifestyle Design and tagged 30 Day Challenge, angiosarcoma, cancer, Macmillan Cancer Research UK, Sober for October, TED talks, Thorotrast on October 2, 2014 by lynne. Stunning waterfront land for sale in Australia! We have a stunning, 1/2 acre block of waterfront land for sale in the Hervey Bay area of Queensland – whale watching capital of Australia! With superb sunset views over the Mary & Susan Rivers, you can build high on the block to maximize your views across to World-Heritage listed Fraser island. With only one neighbor next to this raised, flood-free block, you are guaranteed privacy as you while away your time enjoying the birdlife in the adjacent pristine rainforest. Launch your runabout from the nearby boat ramp or keep your yacht on her own mooring right in front of your land! No boat of your own?? Why not hop on the car ferry across to Fraser Island just 350 metres away, a mere 5 minute walk or 2 minute drive! So why are we offering this rare block for sale? This entry was posted in Lifestyle Design and tagged 4655, Australia, Fraser Island, Hervey Bay, Mary River, Maryborough, Queensland, rainforest reserve, rainforest reserve Mary River, River Heads, Spirit of Hervey Bay, waterfront land for sale, whale watching Australia, World-heritage listed Fraser Island on May 5, 2014 by lynne. We are sharing the LOVE with you all! We watched the opening event of this FG Xpress Pre-Launch Livestream last night & it was AMAZING!! If you want inspiration and you want to know WHY we have joined together with this company (apart from the fact that the product has made a massive difference in Eric’s life) & you are looking for a way to truly make a difference in the world, along with a little – or a lot of extra income, I encourage you to watch this live stream event. Whether you choose this opportunity or at least get fired up to work towards building your own goals and dreams, then I have done my job! We are looking for socially conscious, dedicated Dream Builders to work with – WE are going to go FAR together as a team! WE are going to break down GLOBAL barriers to success for people ALL over the world, even in the smallest communities – as Dr. Benjamin Chavis said – technology is changing the world. Many villages in Africa have no electricity, but they ALL have a device (mobile phone!! )- AND it’s true!! We have seen it for ourselves – Masaai on the Serengeti walking with their mobile phones…..
WHY not USE the POWER OF SOCIAL MEDIA to break down the boundaries to your own success and to contribute to the world around you? WE can ALL make a huge difference together. Imagine being able to empower whole communities around the world and to help people free themselves not only of their physical pain, but their financial pain! Okay, now we’re off to watch the 2014 St. Thomas International Yacht Regatta and we’ll be back soon to watch this event via live stream. WIll you be joining us?? P.S. We finally got around to doing our latest Amarula Sail website update yesterday!! This entry was posted in Lifestyle Design and tagged building your dream, FG Xpress, global consciousness, global opportunity, http://www.livestream.com/forevergreenevents, KIVA, micro finance loans, Powerstrips, St. Thomas International Yacht Regatta 2014, St. Thomas Yacht Club, team building on March 28, 2014 by lynne. Pain free living – how would that be! Wow life is moving along at a fast pace ever since we took on our new business. We are meeting so many new people and sharing the LOVE! The PowerStrips are making such a difference in people’s lives, not least the people whose pain has been relieved for the first time in years. Last week we listened to a range of people talking about their experiences with the PowerStrips. To listen to their powerful stories, click on the links below and forward the play button to the place indicated. One woman (click link and listen from 19:00 minutes to hear Andrea talk about her experience) with a thriving Fitness Centre business was given a Powerstrip when she suffered an injury during a triathlon. Within 3 days she was blown away that the pain had completely subsided. She was not looking for another business with her busy schedule, but she found herself ‘doing the business without doing the business’! She literally shared the Powerstrips with anyone with any kind of pain and is building a healthy residual income alongside her successful Fitness Centre business. Stan has such a powerful story here. You can’t help but be moved by his experience! Single mums (click link and listen from 11:00 minutes to hear Constance talk about her experience) are building businesses from home whilst enjoying spending quality time with their children. Chiropractors and other health professionals are delighted to finally be able to offer a 100% NATURAL pain management product to their clients, whilst building a residual income to help them create financial freedom alongside serving their community. THIS IS SO EXCITING!!! Helping people to live healthier, pain free lives – What a GIFT! THE BEST INVESTMENT YOU CAN MAKE IN YOURSELF IS THE INVESTMENT YOU MAKE IN OTHERS! EFT or “Tapping” has been scientifically proven to work in a number of areas. Tapping is highly supported by some of the world’s leading personal development experts such as Wayne Dyer, Louise Hay, Jack Canfield, Bob Proctor, Gay Hendricks, Arielle Ford, Joe Vitale and so many others. As well as world leading health experts like Dr. Mark Hyman, Dr. Joseph Mercola, Kris Carr, Dr. Eric Robbins and Dr. Christiane Northrup. And even world leading therapists, psychologists and psychiatrists like Eric Leskowitz (Ph.D. – Harvard University), Carol Look, David Feinstein Ph.D., and Dr. Patricia Carrington. The impact it’s having on a global scale is unreal. Tapping is being used with tremendous results for those most deeply affected by the school shooting in Newtown, CT, with children survivors of the Genocide in Rwanda, with hurricane Yolanda survivors in The Phillippines, and with war veterans suffering with PTSD. So I HIGHLY recommend you visit this page and check out the upgrade options and I THANK YOU and appreciate you for supporting the affiliations that I hold in such high esteem. Trust me on this one, this is one of those programs that is a must-have for changing your life……. This entry was posted in Lifestyle Design and tagged 100% NATURAL pain management, 2014 Tapping World Summit, and Dr. Patricia Carrington, Arielle Ford, Bob Proctor, body builders, Carol Look, chiropractors, chronic pain management, Class 1 listed FDA medical device, David Feinstein Ph.D., Dr. Christiane Northrup, Dr. Eric Robbins, Dr. Joseph Mercola, Dr. Mark Hyman, Dr. Robert Gonzalez, EFT Tapping, Eric Leskowitz (Ph.D. - Harvard University), FG Xpress, fitness instructors, Gay Hendricks, Global Business Opportunity, healing with love, hurricane Yolanda survivors in The Phillippines, Jack Canfield, Joe Vitale, Kris Carr, Louise Hay, Natural Healing, natural health professionals, Powerstrips, school shooting in Newtown CT, single moms business opportunity, survivors of the Genocide in Rwanda, triathlon injuries, war veterans suffering with PTSD, Wayne Dyer on March 13, 2014 by lynne. Tapping away from pain and towards prosperity! Oh I am SO glad that I bought the 6th Annual Tapping World Summit series to listen to at my leisure. This year there are daily meditation sessions along with the Tapping interviews, so there are plenty of valuable resources in the package. Have you been listening in? Even though I listened to every single session last year I still bought the package and this enabled me to focus on certain areas of my life that needed work, particularly during the past 3 months. In fact, this past week has been crazy busy and I’ve hardly had time to listen in to the Tapping Summit, but I have continued with my daily tapping sessions. Every morning after I wake up I do a short tapping session on whatever is on my mind at the time and I find that it really helps to focus me for my day. And focus is something I need since we took on our new business. We are busy with the training sessions and meeting our team, not to mention meeting lots of new people and sharing our new business with conscious entrepreneurs around the world. It is so exciting and inspiring to know that we can work with people ANYWHERE in the world with BIG dreams and goals and enable them to achieve these whilst helping their friends and family to move towards a PAIN-FREE life. What a GIFT!!! If YOU have BIG dreams and would like to know more about an amazing, truly global business opportunity, feel free to contact me. My husband chose to reserve judgement on the business until he had tried the product for himself and his testimony is yet another to add to the many that are pouring in…..
Must have for your Medicine cabinet! On a boat it is vital to have strength, mobility and energy. Finally Eric is happy to have found a 100% natural product which has helped him to regain his. 2 years ago I suffered an injury to my left shoulder ligaments-tendons. This restricted movement, depleted strength, induced pain that interrupted my sleep pattern. I live on my yacht & sail a lot, so strength & mobility in my upper arms & shoulders are paramount to my lifestyle.I visited a Chiropractor who manipulated the shoulder that gave some marginal relief for a period of a few days. I have also had regular massage therapy & tried a variety of other techniques. Recently I was introduced to Power Strips & placed 2 halves onto the principal areas of pain for a period of 48 hours. Almost immediately I felt the heat & after a few hours I could feel some pain relief. After 48 hours I had regained significant movement of the shoulder and the pain had also significantly reduced. For the first time in 2 years I could remove a Polo shirt over my head using both arms, a major achievement. A week later I have retained most of the movement & the discomfort-pain is approx 20% of that previously experienced. Time for another Power Strip & to monitor the progress. So if the Tapping doesn’t fix your pain, maybe you’d like to give the Powerstrips a try? This entry was posted in Lifestyle Design and tagged 100% natural health strips, abundance, best MLM compensation plan, Global Business Opportunity, Korean Red Ginseng, Marine Phytoplankton, Powerstrips, Tapping, Tapping prosperity, Tapping World Summit on March 3, 2014 by lynne. As I mentioned in an earlier post I have been busy for some months with my 30 Day Challenges, as consistency is the key to lasting CHANGE. One of my 30 Day Challenges has been the commitment to TAP daily*, which I began in December, but I have continued through January and February, each month with a different focus. And now it is all falling in to place!! Much of January and February I have been listening to so many online conferences, all connected with my interests in Personal and Spiritual development, Health and Nutrition and the exciting field of Epigenetics!! Just over a week ago I came across a brand new division of an established network marketing company, which is in Pre-Launch phase and it is right along the lines of what I have been looking for!! A GLOBAL business that will positively impact the lives of millions of people worldwide! We launch soon with our FDA listed 100% natural health device for pain relief and increased energy, combined with GLOBAL distribution! Best part is – anyone, anywhere can be a part of it. One product, one price, ships to any address in the world for US$4.95! Contact me if you’d like to know more!! The pre-launch videos are all online and available for viewing – ENJOY! This entry was posted in Lifestyle Design and tagged 100% natural, 30 Day Challenge, 6th Annual World Tapping Summit, Class 1 listed FDA medical device, EFT Tapping, epigenetics, Financial Pain, Global Business Opportunity, lifestyle design, Natural Healing, Pain free retirement, Pain management, Physical Pain on February 21, 2014 by lynne. 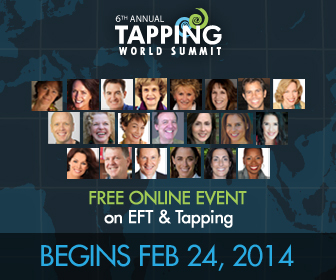 Registration is now open for the 6th Annual Tapping Solution! The pre-launch videos are now all online and available for viewing – ENJOY! This entry was posted in Lifestyle Design and tagged Jessica Ortner, Lissa Rankin, Nick Ortner, The Tapping Solution 6th Annual World Summit, Wayne Dyer on February 13, 2014 by lynne. Powerstrips…. 100% natural pain management! PowerStrips™ are a patented fusion of modern energy and ancient herbs. Everyone, and every part of the body, needs energy. PowerStrips™, worn daily, deliver energy to those parts of the body that need it. PowerStrips™ are FDA listed as a Class 1, Medical Device for pain relief and to improve the look and feel of skin. Solarstrips! Complete nutrition from the ocean! Marine phytoplankton is microscopic plant life that occurs naturally in the world’s oceans. It is the world’s oldest and most nutrient-rich whole food source and, according to NASA studies, is also believed to account for up to 90% of the world’s oxygen supply. Pure, naturally sourced, Kelp face mask combined with the BeautyStrips serum is the patent-pending ingredient known as Telagenex-5 (a form of cycloastrogenol). Developed using latest in peptide science, Telagenex-5 allows the cells to thrive as nature intended to achieve the dramatic results you’ve been seeking. The BeautyStrips™ system is a two-part regimen designed to amplify your timeless beauty and restore your skin’s youthful energy. Please be advised that we have affiliations with the products we are recommending here and we may earn a small commission. We thank you for your support! Please don't hesitate to contact us for more information about any of our affiliate links. If you are not where you want to be in life and you are looking to create more time and financial freedom, we can show you how. We provide the support and training you need (without putting your current job or profession at risk) to design the life you desire and deserve. If you are ready to step up and take action, contact us now!